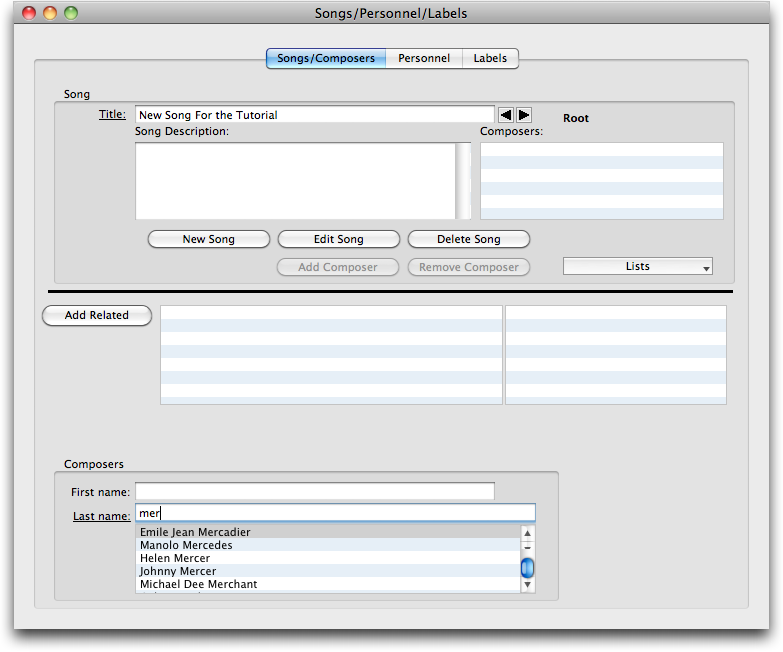 This step in entering a session is to see that all the songs performed are contained in the database and enter them if not found. 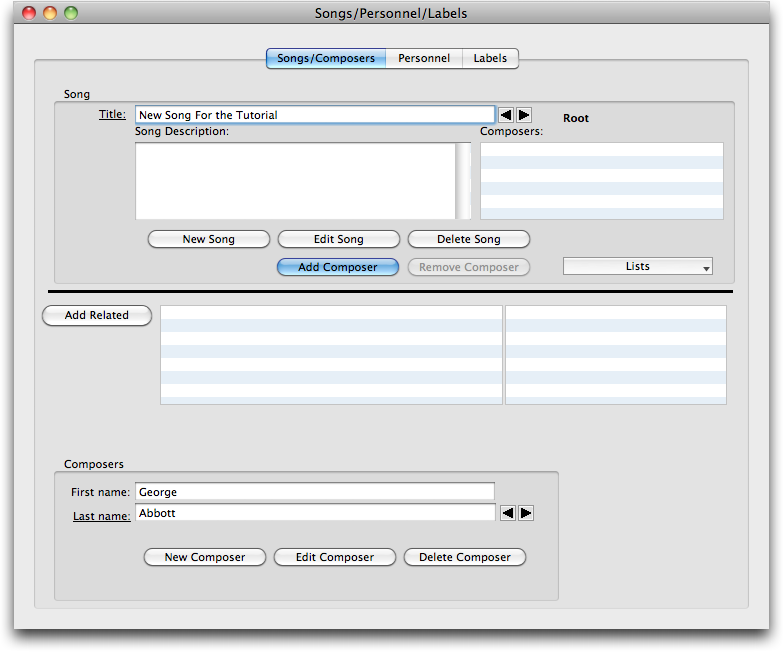 Of course, if you are creating your database from scratch, then the songs will not be there and you can just add them. But if you download the basic starter database for Brian, it will contain thousands of previously entered song titles with the composers. It will help to remember that because Brian is a relational database, song titles are entered only once. 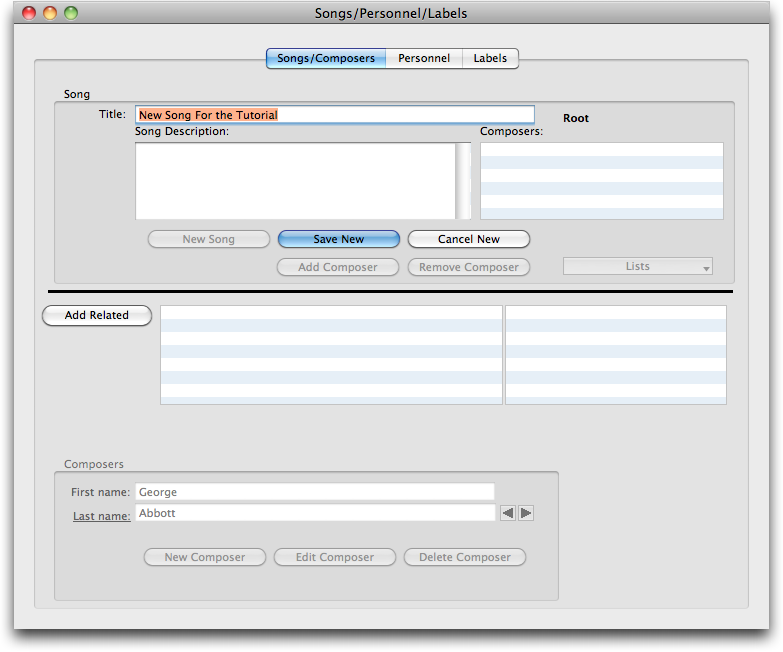 When entering the songs as performances of a session, you will be linking a previously entered song title to the the session. You will not need to enter the song title again for every session that uses it. This will become more clear when the tutorial covers the entry of performances for a session. To start, select Songs from the Windows menu item to display the Songs window. 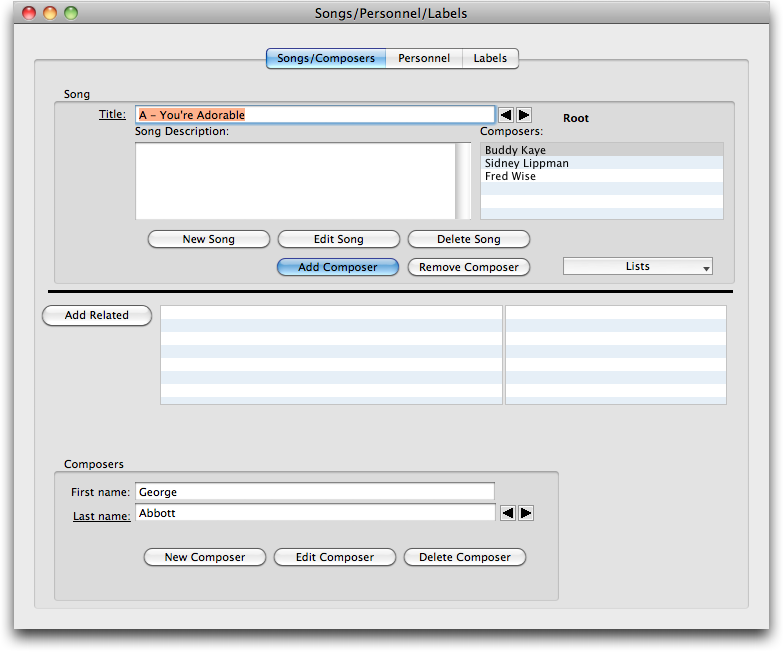 When the window is first displayed, the fields will be filled in with the first song record already contained in the database. So, in the case of this tutorial, that is why the song, A - You're Adorable shows up in the picture below. For this tutorial, we know that all the tunes from the Rat Race Blues session are already on the database. If you type the first few characters of the song title into the Song field, you will see The Rat Race Blues show in the drop down list below the field. Now if you select the entry for The Rate Race Blues from the list, you'll see that the information for the song gets entered in the fields automatically as shown in the image below. But there will be times you need to enter a new tune on the database. The next step will demonstrate that. 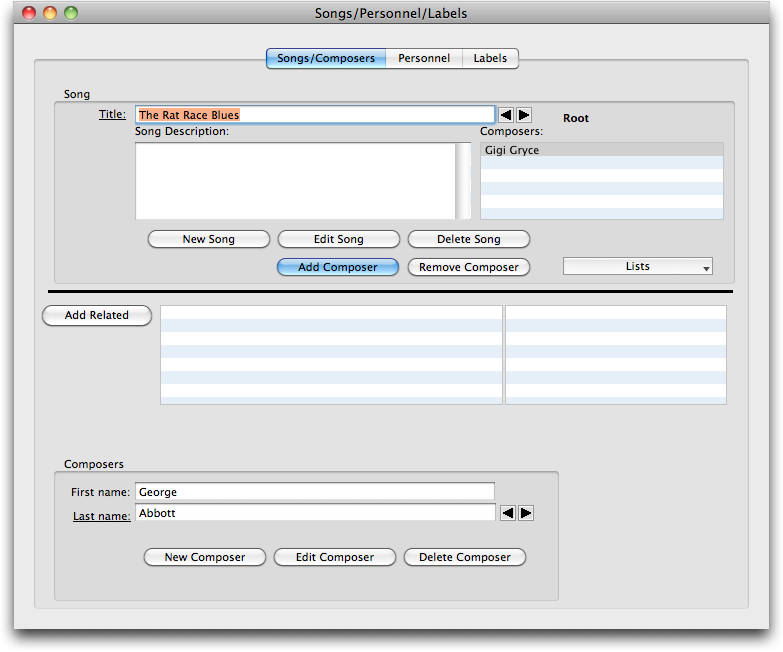 Pressing the New button will clear the text from the Song Title field, activate the Save and Cancel buttons, and dim all the other buttons on the window. The song title can now be entered. The picture below shows the window after the New button has been pressed and the song title entered. For this tutorial we've made up the name "New Song For the Tutorial". Pressing the Save button will add the new song to the database and activate all the buttons on the window so another song can be entered. At this point, the writers can be added to the newly added song. The writers can be added only after the Save button has been pressed. 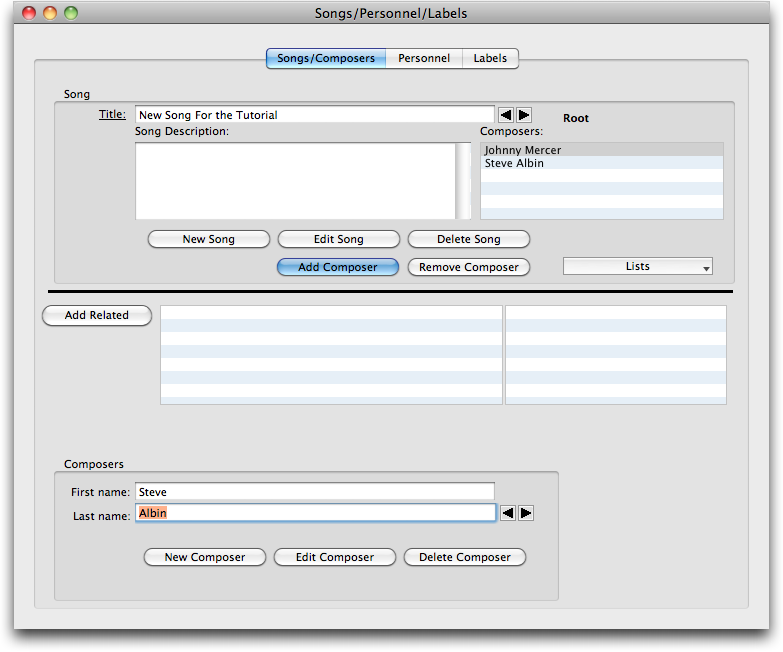 Brian will not allow composer entry while the Save button is active. 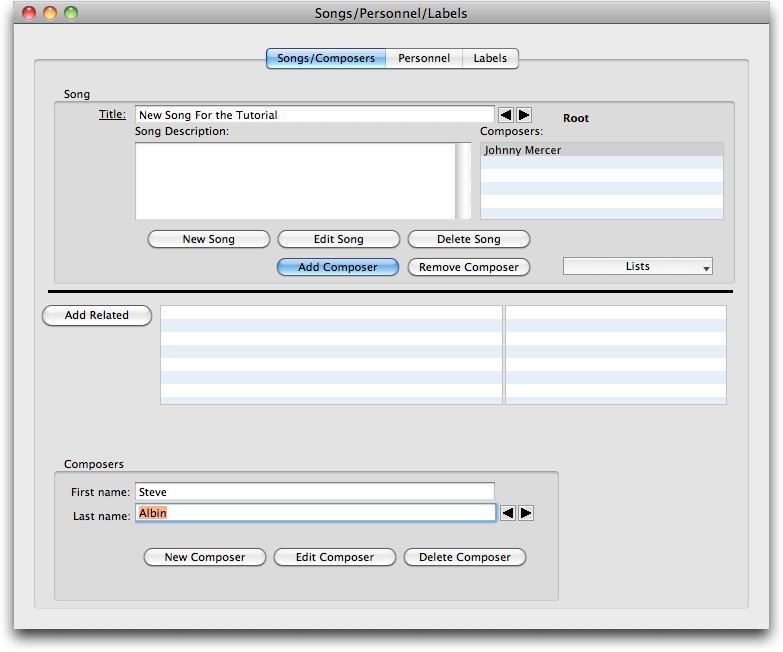 The image below shows the window after the song has been saved. 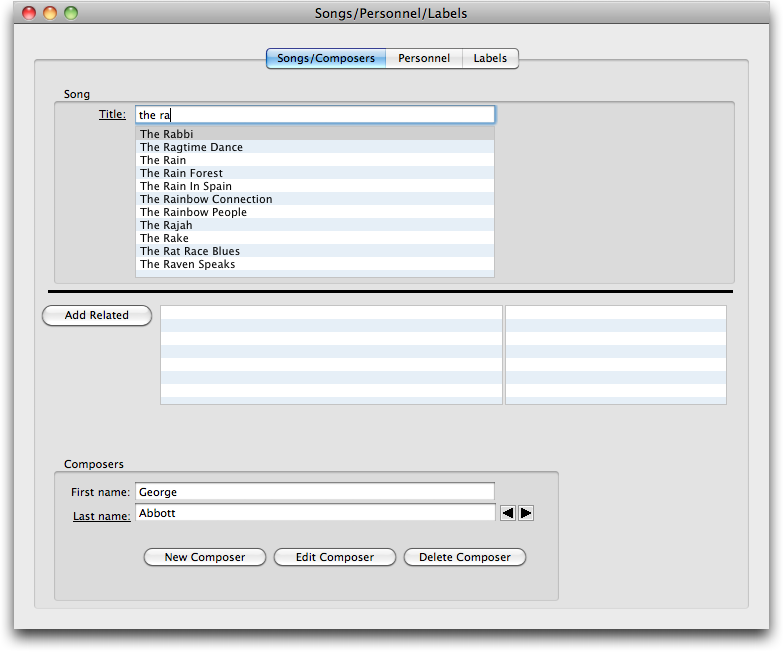 Notice the cursor is automatically place in the Last Name field of the composer so you can go right to looking up the composer for your song. 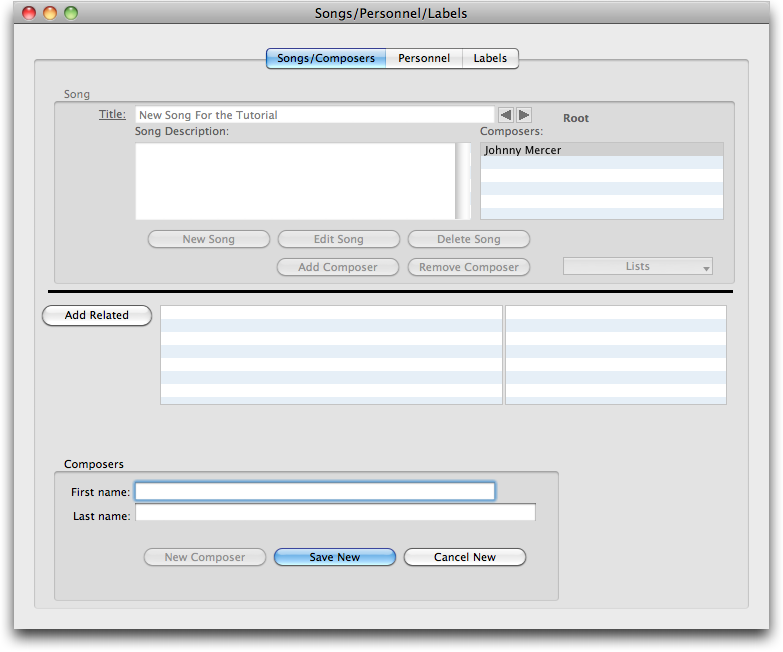 Adding a writer to a song is a process of looking up the composer name so it displays in the writer name field and then pressing the Add Composer button. The Last Name field on the Songs window is a lookup field. This means that as characters are typed into the field, Brian will use those characters to lookup the writer name that is already stored in the datebase. As Brian finds names, it will display them in the drop down list below the Last Name field. Once the desired name is displayed, use the mouse to select it and cause the full name to be displayed in the Writer field. Let us assume the composer for our new tune is Johnny Mercer. Notice in the picture below how the letters "mer" are entered in the Last Name field and in the list below are several names that begin with the same letters. The list is dynamically updated as each new letter is typed. The more letters typed, the smaller the selection list will become. Once a writer is selected - in this case, Johnny Mercer - the full name is displayed in the First and Last Name field and the Add Composer button is activated as shown in the picture below. 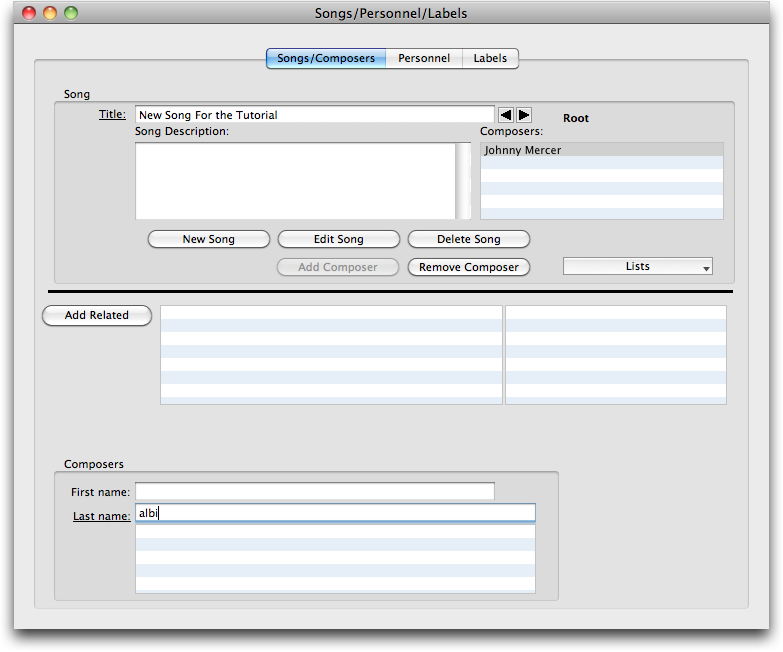 Pressing the Add Composer button will add the name in the First Name and Last Name fields and to the Composer listbox as shown in the picture below. Since the name we want is not on the list, we'll need to add it to the database. To do this, clear the text from the Last Name field so the New Composer button will reappear and then press that button. Enter Steve in the Fist Name field and Albin in the Last Name field and then press Save Composer. This will save the new name to the database. 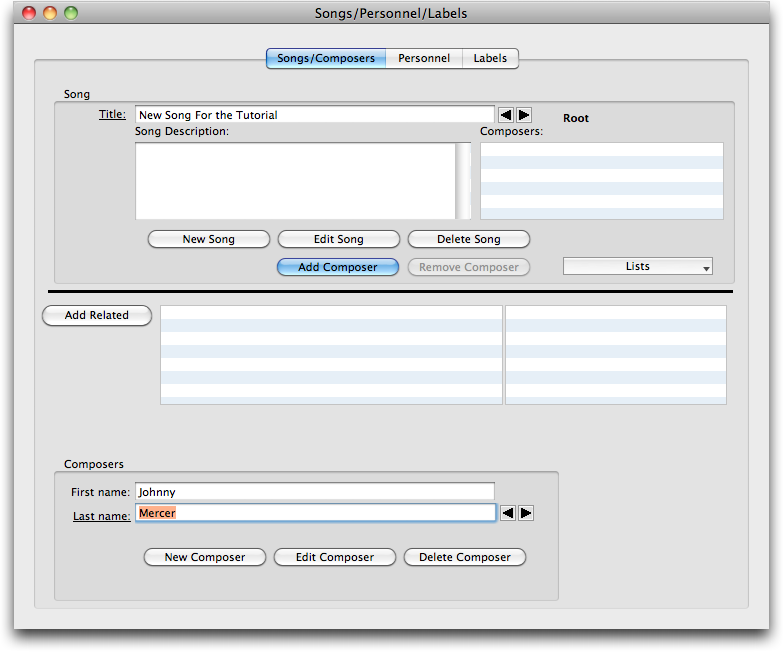 At this point, you can press the Add Composer button to add the newly entered composer to the song as shown below.